Perched on top a mountain on twelve private acres is this one of a kind, architect and designer-crafted, custom built, contemporary home. 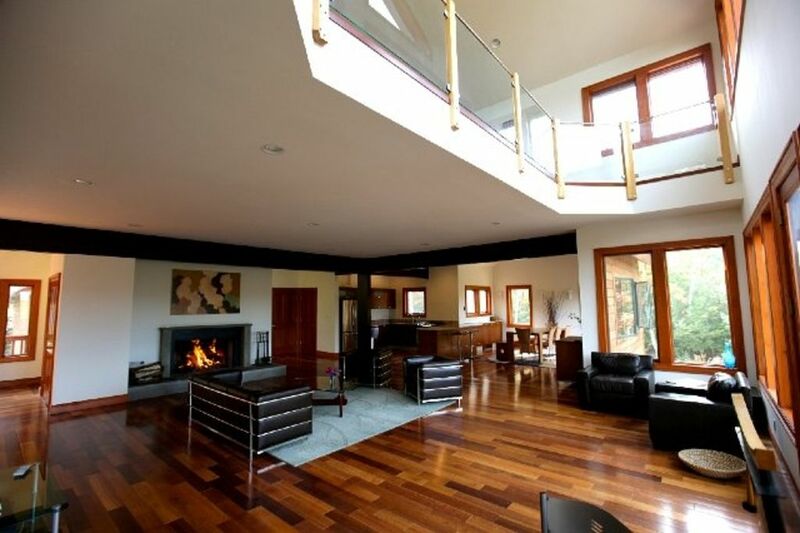 Arguably the newest and best luxury home on the rental market in Ulster County! Made for entertaining in style, this private paradise is located off of a private road in an exclusive area of Woodstock/Hurley that abuts the Ashokan Reservoir. At least seven peaks (at the last count!) are visible from all rooms of the house, and the mountain range views are even more dramatic from the massive floating cedar deck. The house was constructed by master craftsmen, and no expense has been spared on top of the line cabinetry and fixtures. Designer touches are visible throughout...exposed ceiling beams, Brazilian cherry wide-plank floors, Grohe fixtures, limestone tile in bathrooms, Asian inspired above counter bathroom sink bowls, designer lighting, custom staircases, exquisite glass and wood work detail. The custom designed bathroom vanities were built by a craftsman that even Robert Wilson calls upon for his impeccable woodworking! The magnificent living area leads out onto a beautiful deck with incredible mountain views. It has stunning cherry floors, a huge wood burning fire, a serious music system with Smartphone hook up. The open concept format seamlessly integrates the kitchen, dining and living areas together. The top floor was designed as a 'Master Suite' and features a magnificent loft with colossal ceiling-height and spectacular mountain views; a custom glass, stainless and wood loft surround. The loft houses the media area with a 55' flat screen TV, Denon sound system & DVD player. A gallery hallway leads to the massive Master bedroom with cathedral ceilings and the beautifully appointed, Italian limestone master bath which features a custom built double walnut vanity, huge shower with rain head and separate hand held shower, plus a 6 ft soaking tub. The four bedrooms are all generously sized and offer magnificent views. There are three full and one half baths, each custom appointed. All bathrooms include glass, limestone, and/or slate tiling, custom glass work and Grohe fixtures. Each one is uniquely designed and all beautiful. The gourmet kitchen features high end, stainless steel appliances, a gas stove, plenty of cooking utensils, cabinets specifically imported from Italy, and a beautiful Shivakashi-granite countertop. The garden level features another full custom finished bath, a queen bedroom, polished concrete floors, high ceilings, RADIANT floor heating, a massive wood burning fireplace and fantastic open areas for entertaining. The surrounding area offers incredible variety and natural beauty. This is a year round destination: swimming holes abound in the summer, foliage in the fall is incredible, New York's best ski hills in the winter, and the spring is simply magical. There are world class spas and restaurants, and fun shopping in the quirky town of Woodstock, America's most famous small town and birth place of the musical revolution of 1969. Keywords: Luxury Home, retreat, mountain vacation, swimming, fishing, golf, hiking, spectacular views, privacy on 12 acres, minutes to town. I live in New York but grew up in Canada and Bermuda, two wildly different climates! When it comes to property I tend to prefer the extremes....extreme country, or extreme city, and that's one of the things I love about Woodstock. It's less than two hours from New York City, but it's a million miles away with respect to it's ambiance, culture and attitude. Woodstock is a fabulous combination of getting away from it all while still having plenty to do. Christine Barker Realtor Woodstock N.Y. While the eastern side of the Hudson River valley tends toward rolling topography historically suitable for farmland, thanks to the Catskill mountain range, on our side we enjoy skiing, hiking, rock climbing and delicious mountain views. The unique village of Woodstock retains the same quirkiness that attracted the likes of Bob Dylan and Janis Joplin and ultimately the infamous Woodstock music festival, garnering it the title of the 'most famous small town in America'. The pristine beauty of the surroundings inevitably grew an avid following from New York City, so a sophisticated but casual community has evolved. The Town of Woodstock proudly bears the title 'colony of the arts'. There are music concerts, theatre, art galleries, and film festivals along with farm festivals. This really is a year round destination: the summer is lush and beautiful, and people of all ages enjoy the many streams and swimming holes, there is a beautiful golf course golf in Woodstock, a tennis center in Saugerties (15 minutes away), as well as hiking and rock climbing. The fall is absolutely spectacular, the foliage can be outrageous, the air cool and refreshing. When winter hits, there's downhill and cross country skiing, snow shoeing....or just relaxing in front of the fire and taking in the beautiful snowy views isn't too bad either. The fresh air and beautiful light that spring brings is absolutely invigorating. This is arguably one of the nicest rentals in Ulster county. It's private, beautiful, peaceful, brand new...and the mountain views are spectacular. It's on 12 acres and at the top of a mountain, but only a five minute drive to the village of Woodstock. The house is very spacious but also intimate. The bedrooms are large and private, the bathrooms tastefully tiled in limestone and glass with custom fixtures,and the kitchen comfortably outfitted. The house is tastefully furnished, and even with a large group there is enough space to have quiet time if you so wish. 2 oversized wood burning fireplaces. Large 55' flat screen HDTV in media room and flat screen in family room on ground floor family room. Off living room suspended with incredible views. Hunter, Bellayre and Windham Mountains a short drive away. Great experience. Great house. Would go again in a heartbeat. First, about the house. Spacious and clean. Great spaces all over for hanging out with friends. No more than a 10 minute drive into town, but far enough away to be in your own world. The house also has things you might expect, but not necessarily think about (or aren't provided) with other rental houses: supply of clean towels, coffee maker (with filters), a sharp knife, cutting board, cutlery, toilet paper, etc. Probably equal to the house is the contact with the owner/property manager. Fantastic. Always prompt responses to questions via call, text or e-mail. Great information in the week leading up to the stay, and good communication during and after. I'd rent again in a heartbeat. Really a first-class experience. We attended my sons wedding in Woodstock. The bonus to an unforgettable weekend was the rental. We wanted to personally call the owners to thank them for allowing us to use such a fabulous home. Everything was perfect. The mountain. views were breathtaking. The accomodations were more then expected. The kitchen was stocked with the right equipment for nine guests to share meals at a lovely gathering room. The bedrooms and bathrooms were dressed with just the right accoutrements. A short ride to Woodstock on the windy mountain road was enchanting. There was not a downside to this rental. Thanks so much Christine. We wish there was another special reason to come back, maybe my sons anniversary. We loved our stay. The house was immaculate and the view and surrounding area was serene. I've never stayed in such a well maintained and clean vacation home until now. We'll definitely be making a return trip in the future! The property was everything we hoped for — pristine, peaceful, and private. The caretaker was wonderful and proactive, ensuring we had everything we needed when a snow-storm came through. I would absolutely recommend this beautiful home. Seclusion and luxury and only minutes from the town of Woodstock. We had a wonderful time. The home is beautiful, open and spacious. A spectacular view from multiple rooms including the master bedroom. Secluded near the top of a mountain yet only 2.5 miles from the village, shops and restaurants of Woodstock. A wonderful place for rest and relaxation. Wow! This was truly an incredible experience! Such a gorgeous home, so much to be desired here! Totally worth spending he last weekend of summer here! We barely had to leave the house! Everything you need is here! My family absolutely loved this gorgeous house! The views are spectacular, and everything about the house was of the highest standard. It was a pleasure to work with the owners! If you're second guessing yourself, don't! Book this home! Downhill and cross-skiing, snowboarding and other winter sports are always popular with several mountain destinations. Hunter, Belleayre or Windham are within a short drive (30 minutes away) from Woodstock. There's plenty of local sledding on the aptly named Sled Hill right in town. Don't forget to bring your hiking boots and hike one of the numerous trails around the area or hike up Overlook Mountain, Wittenberg Mountain and Slide Mountain.